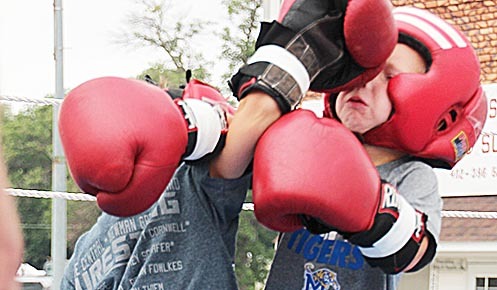 These two young boxers, Ayden Mook of Oakdale and Kallen Dorie of Albion, were fan favorites during the exhibition matches at Petersburg’s Bash in the Burg. Cool weather may have reduced crowd size for the ninth annual Bash in the Burg at Petersburg, but most fans found a highlight during the afternoon and evening festivities. The event concluded Saturday night with a street dance, featuring music by Lemon Fresh Day. The day’s entertainment started with four boxing matches, one of which featured five and six-year-old boys. The match was called a draw between Kallen “The Haymaker” Dorie of Albion and Ayden “Young Guns” Mook of Oakdale. In the opening boxing match, Victor Aviles of Tolvea, Mexico, defeated Josh Spangler of Norfolk. The third match featured Alvaro Arghandia of Madison getting the win by decision over Kris Dorie of Midland, TX. In the fourth and featured bout, Ryan Simones of Norfolk won a split decision over Fernando Lopez of Norfolk. There were 13 barbecue teams competing. Details in the Aug. 9 Petersburg Press & Albion News, Print and E-Editions.